Jowher Ile’s And After Many Days opens upon an unremarkable day like so many others filled with the humdrum minutiae of quotidian life. The incessant rain had finally stopped, and the older brother, just 17 years old, shouldered his backpack and headed across the street to a friend’s home. His younger brother dozed on the couch, and their sister, the middle sibling, dried her hair. There was no indication that a life-changing event was imminent. No one noticed. Paul Utu, the model student and son, walked through the door and out of the life of his family. Paul’s disappearance with no subsequent word rips at the family. His brother Ajie feels terrible because he was the last to speak to Paul, and it is his memories that provide the context that completes the characters and lends clues to his disappearance. Moving seamlessly from the present to the past, Jowher Ile brings his characters to life. This upscale family in Port Harcourt, Nigeria must continue their lives even if no word about Paul comes. His father Bendic is an attorney and Ma (Nne) is a biology teacher and vice principal at a local boys school. Both are highly respected. Ajie is not always the perfect student Paul was but his sister Bibi is an excellent student. They continue to argue as any siblings would because life must go on. There is ugliness here in the presence of a mysterious “Company” that is drilling for oil and gas and destroying the ancestral village of the Utus. A group of militant activists fight a corrupt government doing all it can to suppress their dissent. There are bad individuals such as Ogubuku, a Company stooge who is lining his pockets with their money. These factors, including the disappearance of Paul, create a sense of impending doom. Beauty lies in the strength of family, nuclear and extended, and their reliance on one another. Bendic and his friend, the Application Master, Mark Alari, who is leading a petition against Ogubuku, are shining lights in the fight for justice. Ile unveils a commonality of experiences that remind the reader that the human experience is universal regardless of place. His characters, who become increasingly familiar to us, complain about governmental corruption and failure to support education. They have favorite television shows and endure back to school shopping while siblings argue. We recognize the characters but now see them in a new and different way. And After Many Days is a shining example of growing access to wonderful African literature such as Mia Couto’s Confession of a Lioness and Taiye Selasi’s Ghanna Must Go. Born in 1980 Jowher Ile was reared in Port Harcourt and continues to live there. Until now he has been known best for his fiction in McSweeney’s Quarterly and Litro Magazine. That is about to change. 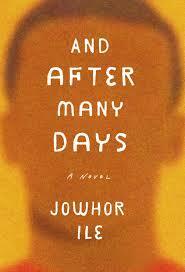 Johwer Ile weaves a tale both personal and political in the disappearance of teenage boy from a Nigerian village.